Footwork is going to constantly keep changing. I just tell people, “You really want to get the true reading of it, you got to stick around for a long time.” The production always has to change. For me, it changed without a thought. It just happened. But a lot of people used to try and figure me out. You can’t walk aside no one’s body and ever think that you could be them. Be yourself. 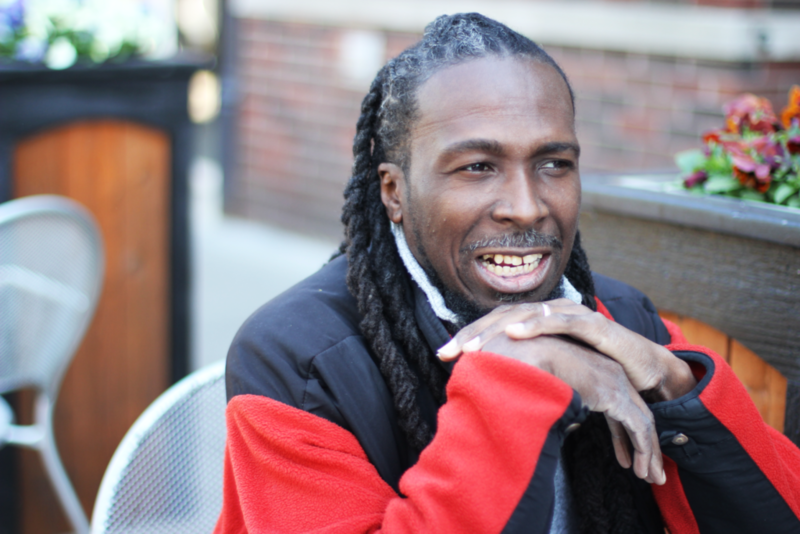 It’s a beautiful spring afternoon, and I’m sitting outside the Medici on 57th with RP Boo. Wearing a red North Face jacket and easy smile, he looks more like an artist or a hiker than one of the most influential musicians and producers in Chicago. But when I first meet him, he’s already been spotted by some fans eager to ask him about footwork, the genre that many say he helped pioneer and revolutionize. Footwork, which grew out of the South and West Sides’ underground juke scene in the 1990s, largely consists of instrumental hip-hop productions that flutter around 160 beats per minute. Although most footwork producers share a few common tricks—sparse arrangements, syncopated 808 drum beats, and chopped-and-screwed vocal samples—the template has been pushed in all sorts of directions by producers like DJ Diamond, Jlin, and Traxman. RP Boo, however—real name, Kavain Space—has been redefining the scene’s boundaries ever since 1995, when he propelled the genre with some tracks he produced on a beat-up Roland TR-6 drum machine. A West Side native who now lives near Rainbow Beach (by the last stop on the 6 bus, he tells me), Space draws on a kaleidoscope of sources and interests, sampling everything from the soundtrack to 2001: A Space Odyssey (on “Kemosabe”) and Justin Timberlake (on “187 Homicide”) to his own voice (on “Speakers R-4”) on his tracks. But he worked apart from the mainstream for much of his career— until the release of his debut LP Legacy in 2013. Today, Space, who calls himself “the source” of footwork, is looking ahead—but while I drink coffee (he’s too excited to spend much time drinking his), he takes a moment to tell me the story behind one of his breakthrough bootleg tracks, “Pop Machine,” which he produced in 2004. The song “Pop Machine” was something that actually took place. When I worked on 59th & Western, there was a pop machine, and you just had to keep pushing the buttons to get it to work, work, work. So one of my best friends, Rogers, said he knew I was going to do something. The next night, it was a party on 87th in Mr. G’s lounge. So, I had just made some heavy heat. I played [“Pop Machine”] at the party, and the crowd’s reception was like “What! ?” It comes with timing. Once you get the flow of it, you live what you produce. Space still brings this scattershot spontaneity to his compositions today. But nowadays, he’s just as likely to bring that spontaneous recording style to the backstage of an Austrian concert hall, where he produced a track last week. “I took my MPC [drum machine] with me, and within three hours of going on stage, I made a track that I played later that night,” he says. He insists that he lands most of his gigs on the strength of his own tracks—something that, upon looking at his Boiler Room set lists, holds up to scrutiny. Where other producers might DJ their favorite tracks from other artists, RP Boo is prolific enough, and talented enough, to play his own work all night. What inspires me? Just life. No matter where I go, I always pick up something—and even if I don’t utilize it, it keeps a smile on me. And what I see gives me a better understanding of how different countries are, how people are, how much love there really is outside the United States. To me, it’s a lot more peaceful going somewhere you’re not familiar with. Because if you have vacation days off, you walk, you see the sea, see the world. What a lot of people take for granted is being civilized. Everybody lacks something. But with other countries, it’s relative, and you learn. In Japan, I’d see the children and try and get their attention, and the way they’d look at me was different. But they’d smile! In China, I’d get more compliments; all the Chinese guys would be like “I never saw people with hair like yours,” and I’d be like, “How?” But the respect I got and the respect I gave, I can incorporate into my music. Although much of Space’s reputation boils down to his mixtapes and live performances, there’s something else that’s had a huge effect on his career: footwork dancing. Even a quick search on YouTube pulls up videos titled “How to Footwork” with hundreds of thousands of views, many of which are set to RP Boo’s music. Dance scenes and producing scenes are deeply and closely linked. [Dance in footwork] has changed tremendously. It’s changed to more of a showcasing—it’s almost extinct [compared with] the real source of it and what it used to represent. A lot of people don’t see it that way because they were too young to really see it. Back when the social media got exposed to MySpace, Wala was doing stuff with Channel 19, so he was able to expose it. But what happened is that [King] Charles ended up getting all this exposure, and it went south in a bad way, because no one knew what went on behind the scenes, the hard work. There’s no money in that. When people see [footwork] on TV, getting exposed, they think there’s money in it. So you’ve got squads, and people [take] it the wrong way. The true inner feeling of it disappeared. It went to “I want to be seeing,” “I want to stunt on stage.” Times have changed. But every time I hop the plane, I’m pushing. I’m not doing this for money; I’m not talking to the agencies asking for money. I don’t come here to say I’m better than Teklife. Don’t have to compete with Teklife. Why? Because I built my own brand…that’s when you make it. We eliminated the competition. There is no competition! You just do your own thing. That’s how the dancers lost their way. Time and time again, Space tells me how the culture has changed over the years, but he’s anything but pessimistic about the genre’s future. Footwork, he tells me, has had more staying power than scenes like jungle and drum and bass—and with Danny Brown rapping over DJ Spinn tracks and Chance the Rapper footworking in his music videos, the following is only growing. [There are] a lot of people out here that really deserve to be seen and heard. I’m not saying no names in particular, but the best thing about footwork, what it is that we do, is that I now have the opportunity—when the time does present itself—to have a [successor]. A person that’s happy with [music] never complains about money, never. There’s some people I’ve got in mind that don’t even know I’m watching them. But after Pitchfork [Music Festival], it’s time to give back. And how you really give back is by educating, and being able to help and teach them how to carry on. One of the biggest things I tell people is that if you make it successful, you have to give back, because that’s what keeps the legacy going. The legacy is already set. Rashad is the only, right now, true legend. That’s it. We all could be legendary, but the legend is a person who doesn’t do it anymore. You have to die in order for your legacy to move on, and Rashad is the first. Back in the ghetto house days, I had tracks that people would be like, “Is he really saying that?” I was almost the worst at it, but I had to change my mindset…after just seeing the streets hurt and crumble. I used to think it was cool, but now I see it’s not cool. It changed. It changed it a lot. That’s why I’m not quick to really do what people think I do. I just sit back and enjoy it. And there’s no end to it. I just don’t think there’s no end to it. [Footwork] has its ups and it has its downs…but there are still good stories yet to come. lvu2 keep up the good work proud of u. Growing up close with my cousin I would have never thought but, who would have.!!!!! In saying that…. Keep doing you and believing in yourself. I always keep up with your progress, I’m very proud of your success and continue succeeding to the highest.